The first time I found this being called Berwick House was in the 1921 sale, before that it was called The Manor House. Earlier still, houses tended generally not to have names, but be named after someone who had lived there, or who had leased it. There was a house here, with outbuildings, yard, garden and orchard before the mid 1700’s. It was called Wakes’. William Wake was the lord of the manor in 1740 who sold the lands and village to James Harris Lord Malmesbury. It is unlikely William Wake ever lived in Berwick. Lord Malmesbury then leased the property to Samuel Rolfe on 1st August 1767. Samuel Rolfe was born in 1735 and died in 1818 aged 83, then living in Stapleford. Samuel Rolfe’s family had lived at Asserton, but he probably lived here. In 1752 it was called The Mannor House, but it was not on a 1773 map of Wiltshire. In 1805 George Baker had the lease of “Late Rolf’s”. He had several cottages/houses and land in Berwick, but he did not wish to keep this one, and arranged an exchange with Lord Malmesbury for some lands in Stapleford. Lord Malmesbury agreed to the exchange on the condition that “… barn to be taken down…” Rolf’s House, outbuildings etc became part of the farm under John Godwin. It was like the other Farm Houses in Berwick, but it was in a more suitable position for a gentleman’s residence. So when Robert Pinckney of Asserton took on the tenancy of Berwick Estate from Lord Ashburton in 1816,it was probably he who rebuilt “Rolf’s House” to make it a suitable, modern house for his family. Social ideas had changed. Gentlemen Farmers no longer wished to be too close to the village, or have a farm yard next door, unlike Richard Coombs at The Dairy House, or John Godwin at Godwins House. Mr Erlysman Charles Pinckney, son in law to Mr Robert Pinckney took over the tenancy of the Estate and Berwick House in 1836. The complex of gardens, orchards and ornamental grounds was made around 1850. The present house dates from early 19th century and incorporates the remains of the older building on the north wall - two stories of rough stone and flint. It is a square late Georgian house made of rendered red brick in Flemish bond with a slate roof, and a courtyard of outbuildings in cob. Mr E C Pinckney lived in Berwick House although he bought Asserton in 1864. He moved there to live with his widowed daughter Mrs Jane Tanner after the death of his wife in 1891. Berwick House was left empty. Mr Pinckney died in 1899 aged 90. In the meanwhile the Estate had been sold. Lord Ashburton sold it to Mr E T Hooley in 1896, and it was sold again in 1898. The house probably remained empty. Then Berwick House was described as … “A very superior Farm House. Standing in well -timbered ornamental grounds, admirably placed and overlooking a beautiful valley and capable of being converted at very moderate expense into a first class country house.” Sir Christopher Furness bought the Ashburton Estate from Mr E T Hooley and only a few years later sold it all, retaining only Berwick House and its Farm for his brother Stephen Furness to live in. After Stephen Furness’ death the House and farm was sold, to Sir Cecil Chubb, then the Board of Agriculture and apparently little was done with the house until the Collins family bought it in 1921. In the 1921 Sale Berwick House was described as … “Standing well back from the Village Street and approached by a well-timbered carriage drive, on rising ground with grand views to the south of the Downs.” It had two attics, six bedrooms, a cellar and a bathroom (one of only two I have found in the village then). The Collins family lived here until 1960 when Miss Morna Mellis bought the house, (the farms had been sold earlier). 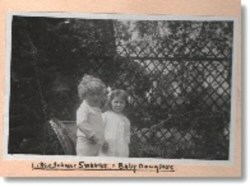 After Miss Mellis came the Humphreys, it is still in the same family. In mid-Victorian times the grounds surrounding Berwick House were altered giving two kitchen gardens and an orchard surrounded by thatched, cob walls, ornamental gardens and woodland. These were considered more suitable to the status of a Victorian Gentleman Farmer, rather than fields. Many people worked in these gardens. Mr William Carter in Victorian times, and in this century Mr Harry Emm and Mr Clifford West. 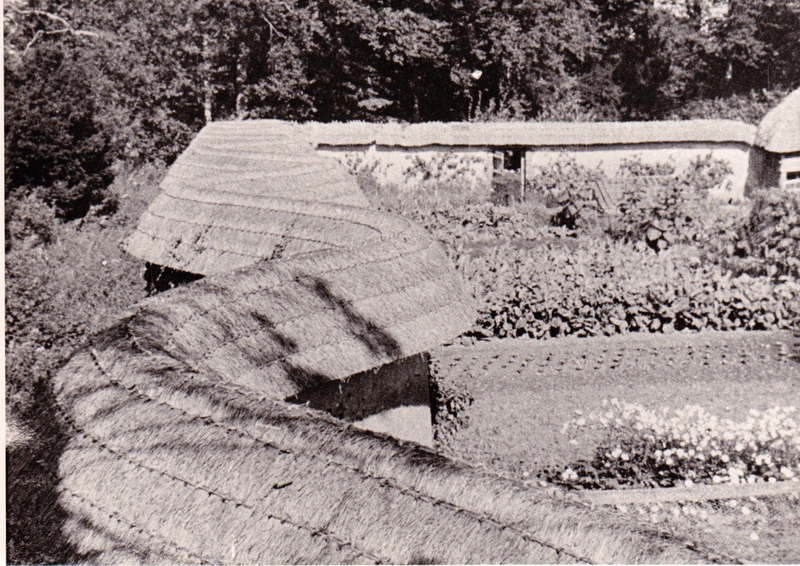 The production of fruit, vegetables and flowers in the kitchen gardens was very time consuming and not viable after the second war, so the gardens were progressively sold and modern houses built in them. RIVERMEAD. This brick and tiled bungalow was built in the Kitchen Garden of Berwick House in 1967, the plot having been bought by Berwick Hill Farm from Miss Morna Mellis who then owned Berwick House. The river side wall was removed and the levels within the garden altered. 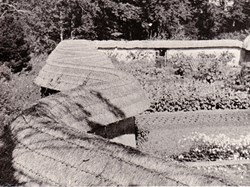 The other walls remained, the thatch having been removed and replaced with tiles a few years before. Particularly outstanding is the Serpentine Wall designed to gain more south facing wall for fruit trees. The bungalow is being extended in 2002. This site had been the main Kitchen Garden, a door in the back wall led to Berwick House. In the 1930’s a tarmac path ran down the middle and ash paths down the sides, there was a well at the river end, and a door in the wall by the river. It then grew all kinds of vegetables and fruit and flowers. Fruit trees grew all around the walls, peaches, nectarines, plums and so on. Now TILL ORCHARD and GOOSE ORCHARD. This walled orchard was sold in 1960 by Mrs Collins to Dr John Lishman. He built Till Orchard and lived there for many years. He was the local Medical Officer of Health. Goose Orchard was built within the site in the mid 1980’s. This is not actually built in the gardens of Berwick House, but this seems the best place to put this house. It was built in 1955 of brick with a tiled roof by Mr G E Street as Berwick Hill Farm House, at the edge of the field called Night Pasture. It ceased to be the Farm House when it was sold to the Poole-Wilsons when Rivermead was built.